I was extremely fortunate in my “choice” of parents. I had both admiration and affection for them, and I always had a great time just shooting the bull with my dad, Leonard Shatzkin. He was a real visionary about the publishing business and was also very witty and cogent. A great deal of what passes for my insight is really just a recycling of his. He died in May of 2002. Until the last six months or so of his life when the heart failure that killed him so weakened him that he couldn’t really think anymore, he was still working hard on what he always considered to be the most important commercial challenge for book publishers: how to manage the inventory in retail locations. In fact, he was developing a system he hoped to commercialize as a solution for independent stores. I didn’t want to say “what independent stores?” to him back then, even though it was already obvious to me that their existence was seriously threatened. Dad had shaped his view of publishing during the 1950s, when the industry was near the front end of what was nearly half-a-century of unfettered growth. That period of growth was over by 2000, and those of us who were trying to measure the trajectory of digital change in the early 2000s couldn’t avoid seeing it. Dad might have seen it 10 or 20 years earlier, but he was intellectually and emotionally incapable of accepting it in the last few years of his life. In fact, while taking control of the inventory in independent bookstores had been the key to the growth Dad fostered at Doubleday in the 1950s and in building the Collier Books imprint, which he created, for what we now call Macmillan I in the 1960s, it didn’t present the same level of opportunity in the 2000s. He had been right for many years about this, but he wasn’t anymore. Another immutable truth in my father’s picture of book publishing which also turned out not to be permanent was his belief that book publishers should just keep expanding their lists, pretty much without limits. When Dad launched Collier Books by doing 600 titles a year in 1962, the entire industry only produced about 10,000 titles. In Dad’s time, it was probably true that most books big houses did contributed to profits, so the more titles you did, the more profits you made. Tom McCormack, who was a protege of Dad’s in the late 1950s and then went on to a long and successful career as CEO of St. Martin’s Press (now part of Macmillan II), attributed much of his success and St. Martin’s to Tom’s own recycling of Dad’s insight. There is this beast in publishing known as the “title P&L.” The “title P&L” proceeds from the mistaken premise that titles, standing alone, deliver profits or make losses. In fact, that’s not true, because a substantial chunk of a publishing house’s costs are not title-specific; some costs are not really attributable in any sensible way. The way “title P&L”s normally work is that “overhead” — rent, salaries, etc. — is figured as a percentage of sales (which, if you look back to last year, is, indeed, a calculable number across any company.) By “distributing” the unattributable costs that way, the logic says, you make sure that each book covers its “share” of the costs of keeping the doors open. But, as McCormack pointed out many times over his career, the rent didn’t go up because he signed a new title and it was nonsensical to charge each title, let alone each sale, for the rent. Dad had a very succinct and persuasive way to explain the folly of the “title P&L” logic. What he suggested is that every house do a recalculation of their overall P&L at the end of each year. To do it, they should take out every title that failed to earn back the overhead charge (usually somewhere between 35% and 45%) because those had, by the internal logic, “lost money.” Surely, if you take out all the titles that lost money, you would see your overall calculation of profits rise. Right? But it never does, it always falls. Why is that? Because most of the titles deemed to have lost money by “title P&L” logic actually made a contribution to overhead. That is, the direct revenues attributable to that title were greater than the direct expenses charged to it; they just weren’t sufficient to be scored as profitable when the overhead tax was deducted. But if you subtract all the books that earned 6% or 10% or 19% or 34% margin on sales, you subtract actual dollar contributions to overhead and profit. Important point: overhead and profit are both produced by gross margin on sales. When enough margin has been generated to cover all the overheads, the margin becomes profit. So titles don’t earn profits or losses, they contribute more money or less to overhead and, in some cases, actually don’t recover their direct costs. The titles that don’t recover their costs clearly have lost money; all other titles contribute to overhead and, if it is covered, to profits, but they aren’t, strictly speaking, profitable in and of themselves. That’s because each title published today is facing a much more challenging commercial environment than each title published two, three, four, or five decades ago. 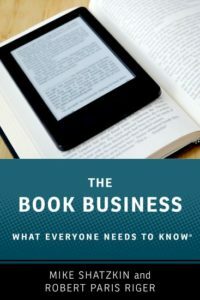 Each title competes with more titles in the marketplace and more new titles coming into the marketplace: print-on-demand and online used books have snared a great deal of market share that used to be available only to new titles and backlist kept alive in print-run quantities by publishers. And, for the past 10 years, each new title is coming into a marketplace that has less shelf space available for books overall than it had for the last title. So the “keep publishing more and more” paradigm that Dad believed in and that McCormack credited with St. Martin’s growth may not actually work anymore. In fact, any sentient publisher today would have to look at their output regularly to recalibrate what new title publishing is actually profitable. I expect that analysts in every major house are slicing and dicing their lists, trying to figure out whether they can discern — by level of advance or subject matter or by imprint or editor or agent — which bets will return the cash invested and bring profit to the house. We can assume those analyses are being done, but can we assume they’re being done right? Without any inside view of the details (and I don’t have one), we’ll assume (hope) that the crude application of a single overhead percentage to each title is not the standard for analysis. If it is, the house doing that will almost certainly be led to erroneous conclusions, just as Dad and Tom pointed out they were if they saw a book that contributed 30% margin as “unprofitable” and would think they’d be better off not publishing it. The big publisher of 2010 has another problem besides the reality that new titles are harder and harder to launch to any standard of acceptable return. They also have to feed a machine built to handle a certain volume of printed books when the decline of print book sales is being accelerated by the shift to digital. The additional margins in digital (which are being produced as long as prices can be maintained) are not very helpful if they need to be diverted to pay for warehouse space, field sales forces, and higher unit printing costs because there is less print “throughput” to support them. Big publishing management is aware of this challenge; it is part of what drives up the value (and prices) of big brand franchise authors. The big authors are still the fastest way to guarantee the volume of print output and sales necessary to fill those volume-guarantee contracts with the printers, absorb the warehouse space, and cover the cost of calling on accounts that sell print only. And look at the irony. With less volume, unit costs per book go up, which reduces total gross margin. And if warehouse and sales organization costs are fixed (they aren’t but it is hard to adjust them quickly, the way you can cut a press run or a marketing spend), then the percentage of sales they will consume will go up. So much for calculations of overhead as a percentage! The big variable publishers have to deal with today is marketing cost. The most common rationale for list-cutting is that it will allow a greater amount of marketing attention to the books that are published. But that articulation actually begs the question, because marketing resources are variable. If you add more, you increase the overhead nut you have to cover before you get to profits. And if you reduce those resources, then you’ll be chasing your tail trying to put more marketing effort behind each title. The analysis of how to cut has to be done; it is pure insanity for publishers to keep cranking out new titles if they are losing on many of them. Some of the ones they lose on have the potential to be big but just don’t make it; some aren’t even seen to have that potential. But the ultimate answer is not in how or how much a publisher can reduce title output, but in how they focus it. That’s the secret to reducing marketing costs and it is something we will certainly explore in another post someday.